Have you been ‘Leopard Spotting’ on your trip to Jodhpur ? Surprised, don’t be. On my recent visit to Jodhpur RIFF which by the way was awesome, I was whisked away by a close friend to Bagheera’s Camp. A comfortable three and a half hours drive from Jodhpur, passing the famous Bullet Baba’s Temple (look it up on Google if you don’t know about it); it’s a serene place in the rural heartland of Rajasthan. We drove through semi-arid terrain and closer to the camp the panorama included unusual rock formations which are the Aravallis, one of the oldest mountain ranges in the world. If you are lucky enough to be driving down on a moonlit night, the entire scene is bathed in soft light reflecting off these granite mountains. The campsite is spread over a vast area which includes two lakes, few villages and of course interesting wind eroded hills. I was promised leopard sighting when we went on our early morning safari. Being unlucky with games throughout my life I was pessimistic. We woke up before dawn, fitted our vehicle with a spot light and within twenty minutes reached a hill where there were supposedly leopard with cubs. We passed another vehicle coming from the opposite direction and its passengers, by the look on their faces had been just as unlucky as I was with all my previous game drives. Suddenly we stopped. My tracker standing with me at the back of the pick-up truck was pointing somewhere near the top of the hill. For the love of god I couldn’t figure out what he had got so excited about. Then after thirty-second of staring into black space, I saw a head move. There were not one but three leopards sitting on the rocky precipitate. These beautiful animals were gracious enough to sit in plain sight for nearly half an hour before getting bored with us and moving on. I unfortunately don’t have a telephoto wildlife lens, so my capture wasn’t world-class. On the rest of the drive we passed through villages and villagers going about their daily lives. The villagers are friendly, know your host, and welcome you into their homes. Saw the dam, which supplies water to most parts Western Rajasthan and at the lake spotted birds and crocodiles basking in the early morning sun. I would be lying if I said that leopard spotting isn’t going to be the biggest draw for the camp. But the camp is so much more. The permanent structures on the camp site are the typical olden day’s hunter’s lodge. Right in front is the smaller of the two lakes, a protected breeding ground for birds as well as crocodiles. The tented camps (Shikari Tents- not pitched on my sudden whirlwind trip) are on the other side of this water body. Water is life and scares in this part of the world. The two lakes make sure that this region is an annual stop for migratory birds, the first flock of which I saw on my return back to Jodhpur. Don’t expect a swimming pool or a Jacuzzi, it’s not possible here. But expect complete relaxation, good food (vegetable are grown either on the campsite or nearby village farmland), wildlife spotting and great hospitality. I would suggest spending at least two nights here to enjoy the tranquility of the place. There are very few times in life when an event exceeds your expectations. This year’s Jodhpur RIFF (Rajasthan International Folk Festival) turned out to be one of them. I had been planning this trip for a long time and I was traveling with friends who had joined me only because I had sung high praises about this festival. So the pressure was on. The festival was a five-day event, with the three days in-between jam-packed with programs. Jodhpur is the second largest city of the Indian state of Rajasthan. Mainly known for its impressive Meherangarh Fort the city is known as the “Blue City” due to the blue-painted houses around Mehrangarh Fort. Mehrangarh is the best desert forts that I have seen: below it and spreading west from its heights, the old murmuring city shimmers in a blue haze. 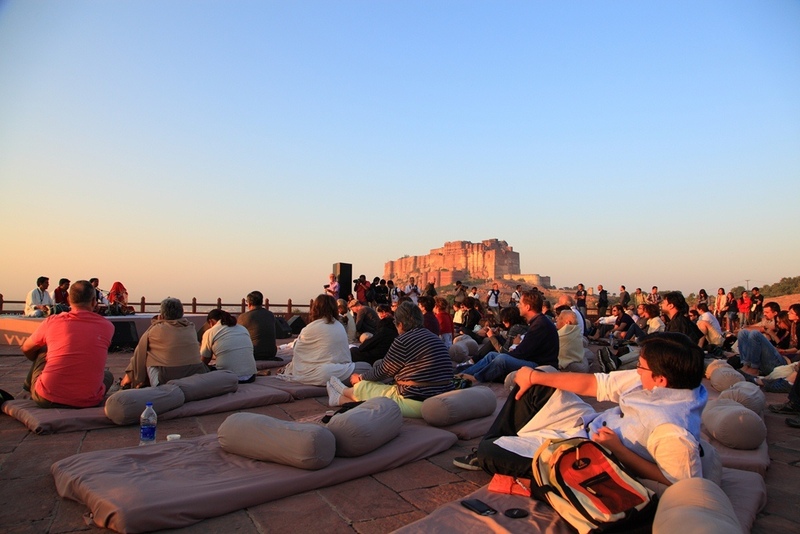 During the festival you have exclusive access to the fort at night which otherwise closes at sunset. It’s a special feeling walking up the fort ramparts under moonlight with soft music reverberating through the night air. The first performance of the festival was an entry free event held in the evening at the City Clock Tower. On our exploration of the city during the day we had seen the stage being put up. Now at night the scene was totally different. The Clock Tower was illuminated with soft light and there was an area in front of it cordoned for people to sit. Being a free event I wasn’t expecting much from this session. But I was proved wrong. The program started right on time. One after another performers took center-stage and mesmerized the audience. It was a teaser to the things to come – we saw some of these performers again on the Main Stage (Old Zenana courtyard inside Mehrangarh Fort). There was traditional Rajasthani dance and music like Chakri, Braj Ki Holi, dances with fire as well as international performers like Mark Atkins on the Didgeridoo and Naadro on the drums. How one and an a half hour passed by we would never know but by the time we were heading back there was only one thought in our minds – if this was the free event how good would the main events be ? The entire festival is beautifully planned. Held during the moonlit nights there are multiple venues – the Royal Gardens, Jaswant Thada, City Clock Tower, Nehru Park and Courtyards inside the fort. Dawn and dusk events were at Jaswant Thada. The dawn devotional music was an ethereal experience. You have relaxed seating on the ground with a bolster for backrest. To your left, lies the city below you disappearing into the horizon under the soft morning or evening light and to your right beyond the Roa Jodha desert park lies the majestic fort. During the day the action shifted inside the Mehrangarh Fort. The ‘In Residence’ events held at the Chokelao Bagh gave an opportunity for guests to interact with traditional artists. In the evening after bidding adieu to the setting sun we welcomed the rising moon. The fort shimming under clear moonlight nights accompanied by soul-stirring music will be a feeling that I will not forget for a long time. We actually had a tough time deciding what all to attend and what to skip. After day one where we didn’t catch even an ounce of sleep, we decided that we would attend all the evening sessions, stay till morning and sleep during the day. Personally what I enjoyed most were the jamming session between the Rajasthan’s traditional performers and international legends. Day One saw a wonderful collaboration between Mark Atkins (Australia) on didgeridoo and Rajasthani percussionists. Day Three saw classical vocalist Praveen Khan (Jaipur), Rhys Sebastian (Mumbai) on the Saxophone & Joseph Tawadros (Australia) get together. Later Naadro (Sri Lanka) jammed with Rajasthani artists. But if I had to pick a favourite it had to be the soulful music played by Ross Ainslie (Scotland) & Jarlath Henderson (Ireland) on Uilleann pipes & flute. Every year the festival appoints a ‘RIFF Rustler’ and this year it was Ratikha Wickramratne, the lead percussionist of the Sri Lankan band Naadro. The Rusler is supposed to pick artists to team up and the product is something unique. So the very last club night was a mix of Scottish, Sri Lankan, Rajasthani and a beep boxer. It was an amazing session. During the festival we had the Director of the Edinburgh International Festival; one of the oldest music festivals comment that even though this is a young festival in comparison, the festival’s backdrop that of the Fort along with the patronage of HHM Gaj Sigh II makes it second to none. I couldn’t agree with him more. Next year the Jodhpur RIFF festival is from the 17th-21st October 2013. Why don’t you join us?